The Game Developers Conference was held last week and several sites had an opportunity to get a “hands on” with Star Wars: The Old Republic. When playing a story mission in Star Trek Online, it’s all text delivered through a little dialog box. More times than not, it’s usually an alien race harassing a Federation colony, and you need to step in and blast them out of the stars. From the little that we’ve seen of The Old Republic so far, this much is certain: you will have many different story arcs available to your character available out of the box on day one. Recently we saw some of this in action as we got a taste of the Trooper’s story arc, and what it was like to be a part of Havoc Squad (a mercenary group, essentially). 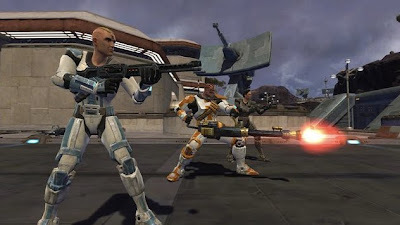 The mission assignment itself was simple: infiltrate a base on Ord Mantell and obtain a secret weapon known as the ZR-57. Though, during this mission, we interacted with other members of our squad, talked with the locals to pick up side-missions along the way, and even decided the fate on some of the guards in the base — all with spoken dialog for every character (even ours). Adding that level of immersion in an MMO is huge; it felt like we were playing Knights of the Old Republic all over again (that’s a good thing). It seems to have been rebalanced somewhat in the last few months – or at least, the Trooper is a little less destructively overpowered than the Inquisitor was. I don’t die, but my health bar gets whittled down dangerously low by extended scrums with four or five of the separatists I’ve been sent to fight. 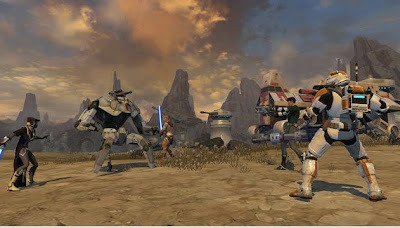 “We don’t want you to have to wait until you hit the level cap to feel powerful,” Jake Neri, a producer for the game on the LucasArts side, tells me. “We want you to feel heroic and powerful right from the get-go. Be on the lookout for more hands-on articles coming this week!